"The decisions of the Church, in its jurisdiction, are valid for the conscience of all individual believers... creating an obligation of conscience." -Pope Gregory XVII ("Siri"), His Letter "Orthodoxy: Church-Faithful-World", August, 1962. This letter, "Orthodoxy", was released on the eve of the Apostate V2 Council. 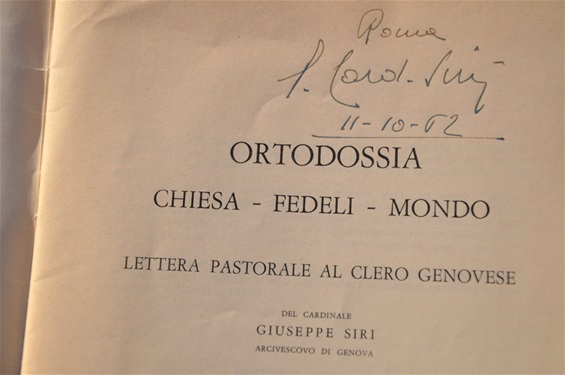 His Holiness had heroically been publicly condemning the infiltration of Communism in the Italian episcopacy itself, at the same time (1962). There is very strong evidence the hostage pope was drugged/controlled at the usurpers "Council". Pope Gregory XVII would later declare in 1967 that for him, the Council was a, "difficult labor and a very great suffering." He also said that Roman Catholics would, quote, "not be bound by these (The Second Vatican Council's) decrees". Logically the True Pope could only make such a statement (Decree) if the V2 Council documents LACKED papal jurisdiction (Church Authority) - which they incontrovertibly did.